Although established in 1917, the Florida Museum of Natural History ichthyological collection was small and parochial in character until the late 1950s. Leonard Giovannoli served as part-time curator during the 1930s and 1940s while teaching in the University of Florida Department of Biology. Another member of the Department, John D. Kilby, assumed curation responsibilities in 1951 and served through the decade. During this period the collection consisted mainly of Florida freshwater and shallow-water marine fishes. Several valuable collections were obtained in the late 1950s that signaled an upswing and broadening of ichthyological activity. These included small marine collections made in the Bahamas; estuarine and marine fishes from Tortuguero, Costa Rica; marine fishes from Jamaica; and marine fishes from the southeastern United States and Gulf of Mexico captured by the U.S. Fish and Wildlife Service exploratory fishing vessels Oregon and Silver Bay. John C. Briggs (1954-1957), Daniel M. Cohen (1957-1958), and Donn E. Rosen (1959-1961) later were active in the collection. 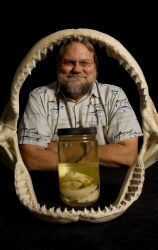 Carter R. Gilbert was hired by the University of Florida Department of Biological Sciences in 1961 and subsequently (1963) joined the Museum staff on a full-time basis. George H. Burgess has been associated with the collection since 1975, first as a graduate student and subsequently as a staff member. The scope and growth of the fish collection has increased substantially during the last 35 years. An osteological collection was initiated during the mid-1960s and now comprises over 2,500 lots of disarticulated skeletons. Important reef collections from the tropical western Atlantic region have been added as a result of work on Grand Cayman Island, Antigua, the Bahamas, Isla de Providencia, and Florida. Freshwater and estuarine collections were made in Bolivia, Colombia, Costa Rica, Guatemala, Panama, and Venezuela. Donations of Venezuelan freshwater fishes have been received from Donald C. Taphorn of the Museo Zoologico, UNELLEZ, in Guanare periodically since 1977. 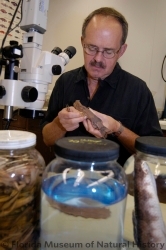 UNELLEZ and the Florida Museum have in place an agreement that facilitates cooperative research programs in ichthyology and other disciplines. Small collections of Mexican freshwater fishes have been received periodically. The 1979 and 1985 donations of several thousand lots of deepwater marine fishes collected in the Gulf of Mexico and Caribbean Sea by National Marine Fisheries Service Southeast Fisheries Laboratory, Pascagoula personnel have significantly bolstered our holdings from this area and habitat. Substantial collections of marine fishes from nearshore and deep waters off the Carolinas, northeastern and southwestern Florida, the Mississippi Delta, Texas, and Campeche, Mexico have been made in recent years, greatly augmenting the historically strong Florida Museum of Natural History coverage of these areas. Since the late 1970s the insular faunas of Hispaniola and the Cayman Islands have been surveyed extensively by Florida Museum of Natural History personnel; Florida Museum of Natural History holdings of Hispaniolan freshwater fishes are considerable and continue to grow. We also have received collections of fishes collected from Indo-Pacific reefs; Southeast Asian (Thailand and Malaysia) fresh waters, estuaries and nearshore marine waters; and Antarctica. Numerous freshwater collections from various parts of the United States have been accessioned throughout the years. In addition to extensive collecting by Florida Museum of Natural History staff, a large number of important collections of North American freshwater fishes have been received from many individuals, private firms and governmental agencies. Notable additions include 825 lots of selected eastern U.S. species from Robert A. Kuehne and Roger W. Barbour of the University of Kentucky, approximately a thousand lots of Maryland fishes, 550 lots from Illinois, 500 lots of Georgia fishes, 500 lots from Virginia, 400 lots of Mississippi fishes, and over a thousand lots from North Carolina. Valuable reef fish collections from the Carolinas have been accessioned continuously since the mid-1970s. Florida marine and freshwater collections have been forwarded by numerous individuals and organizations. Some of the most significant acquisitions include major donations of freshwater material from the Everglades and the Florida panhandle; freshwater and estuarine collections from the Indian River region; inshore and reef fishes from the Boca Raton and Palm Beach areas; estuarine surveys of the lower St. Johns River; and marine fishes from the northeastern Gulf of Mexico. The National Biological Service’s Gainesville laboratory has been particularly active in surveying Southeast U.S. freshwater fishes and their valuable collections are continually accessioned into the Museum. The largest, and perhaps most important, acquisitions have been the fish collections formerly housed at the Tropical Atlantic Biological Laboratory (TABL, now the National Marine Fisheries Service’s Southeast Fisheries Center, Miami); Florida State University (FSU), Tallahassee; and the University of Miami (UMML). Approximately 75% of the TABL collection was transferred to the Florida Museum of Natural History in 1972-1973. 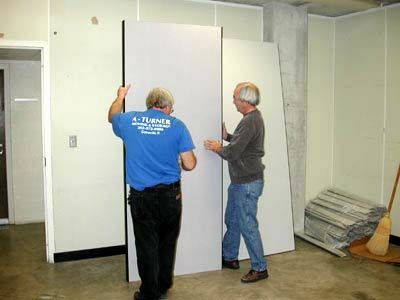 Most of the remaining TABL material was moved to Gainesville in 1995 as part of the transfer of the UMML collection to the Florida Museum of Natural History. The TABL material consists mostly of fishes collected in the tropical western Atlantic region, beginning in 1950, by U.S. Fish and Wildlife Service exploratory fishing vessels, with lesser quantities taken during exploratory work conducted in the tropical eastern Atlantic, and from estuarine and nearshore surveys in the southeastern United States and Gulf of Mexico. 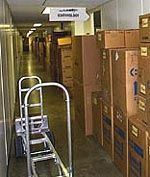 The transfer of the FSU collection (27,300 cataloged lots plus backlog) to Gainesville in 1982 was supported by a National Science Foundation curation support grant. The addition of the FSU collection solidified the Florida Museum’s freshwater and marine coverage of the Florida panhandle, added significantly to holdings of non-Florida southeastern freshwater fishes, and enhanced the scope of Central American freshwater and Caribbean marine coverage. 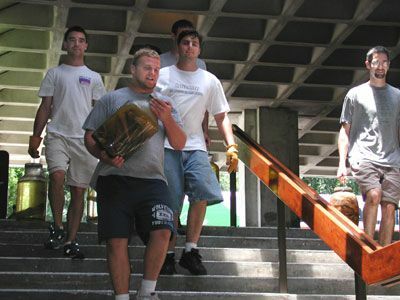 In late 1995, the University of Miami’s 35,000 cataloged lots (plus an estimated 40,000 backlog lots) were transfered to Gainesville and are now being incorporated into the Florida Museum of Natural History. This historically important collection has significantly enhanced coverage of western Atlantic reef and deepwater marine habitats, and bolstered holdings of tropical eastern Atlantic and tropical eastern Pacific fishes. The origins of the University of Miami ichthyological collection trace to the early 1950s. A small collection which had been started by Mr. Luis Rivas at the Marine Laboratory had been transferred to the Department of Zoology on the university’s main campus by the time Dr. C. Richard Robins arrived at the the Marine Laboratory in the fall of 1956. Dr. Robins immediately started a survey of the inshore fishes of the Florida Keys, a project that continued until the early 1970s with grant support from both the systematics and ecology programs of the National Science Foundation. Nearly 1,000 comprehensive collections using ichthyocides were made by Dr. Robins and his graduate students. Many of these collections are of great historical significance since they came from areas that have subsequently been destroyed by development or are now in National Park preserves. Florida Bay samples are especially valuable because they preceded the environmental degradation that characterizes this area today. Other important additions of marine reef and shore fishes were made by Dr. John E. Randall, principally at St. Johns in the U.S. Virgin Islands, and by Dr. Robins in the western Bahamas and in the Lesser Antilles (Grenada, St. Lucia, St. Vincent). Additional shore and reef collections were made in a variety of Caribbean locales, including Haiti, Panama, and Trinidad. Deepwater trawling on Arrowsmith Bank yielded many unique collections. With the departure of Mr. Rivas from the University of Miami, the fish collection at the Department of Zoology (approximately 7000 lots) was returned to and merged with the collections at the Marine Laboratory. With few exceptions, these lots were not recatalogued and are not included in the 34,648 catalogued lots that bore the UMML acronym. In addition to the historically important collections of shore and reef fishes from the Florida Keys, the Bahamas and the Caribbean, the University of Miami holdings of oceanic and deepsea fishes were among the world’s most important and, from a fiscal standpoint, the most valuable. Extremely expensive oceanographic research utilizing principally the research vessels Gerda, Pillsbury, and Columbus Iselin were made on projects supported by the National Science Foundation, National Oceanographic and Atmospheric Administration, National Geographic Society, and Battelle Institute. These vessels comprehensively surveyed the Straits of Florida, the Bahamas basins, the Caribbean Sea, the Gulf of Guinea, and the Gulf of Panama. Most of the very extensive collections from Tongue-of-the-Ocean are studied but uncatalogued. These surveys were made as part of a carefully designed quantitative ecological study and are of great importance. A fair number of mid-water trawl collections are available from the Bahama basins. The Tropical Atlantic Biological Laboratory (formerly U.S. 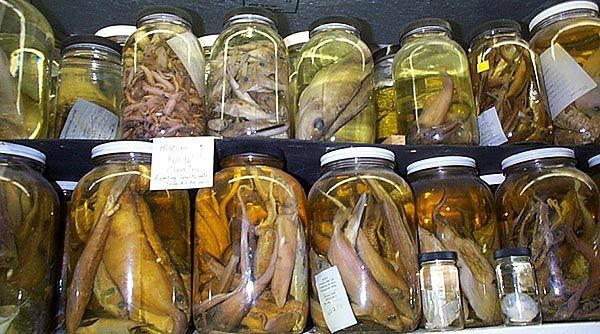 Fish and Wildlife Service, now National Marine Fisheries Service’s Miami laboratory) collection was disbanded and part of its collections transferred to the University of Miami in 1972. These collections were integrated into the University of Miami collection but were not catalogued. Subsequently, large numbers of lots of fishes trawled by the National Marine Fisheries Service vessels were sent to Dr. Robins for identification and were added, uncataloged into the collection. The University of Miami collection contained valuable eastern Pacific collections taken in the Gulf of Panama by the R/V Columbus Iselin. These trawl collections were made following transects from shallow to deep (1000 fms) water. Reef collections made while diving on the Argosy expedition are present from the Pearl Islands south to Ecuador. Eastern Atlantic trawl collections from the Gulf of Guinea are among the best available from that area. The catalogued collection was thus only part of the holdings represented by the fish collections. When the Zoology Department, Tropical Atlantic Biological Laboratory, and National Marine Fisheries Service transfers are accounted for, along with some 10,000 lots of Tongue of the Ocean and Exuma Sound fishes, the sorted and shelved materials amount to about 65,000 lots. 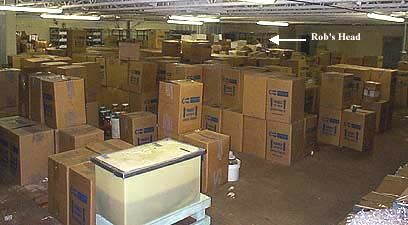 Unsorted collections, perhaps 10,000 in number, shelved separately, swell this number significantly. Numbers of specimens were monitored for a number of years and it can be reliably estimated that there are on average ten specimens per catalogued lot. The University of Miami collection probably comprised 750,000 or more specimens. It was the policy of the University of Miami collection not to retain holotypes and these were transferred to other institutions, most notably the Academy of Natural Sciences of Philadelphia and the U.S. National Museum, at the time of their descriptions. At the time of this writing, more than 200 lots of UM paratypes, representing greater than 500 specimens, have been recovered and are now housed alongside other Florida Museum of Natural History types. Previously catalogued UMML types and all other cataloged lots have been re-catalogued by adding 200,000 to the UMML number (eg. UMML 30,000 = UF 230,000) in the interest of retaining the identity of the collection. It is anticipated that many additional paratypic lots will be discovered with increased curation. With the acquisition of the University of Miami (UMML) collection of fishes, the staff of the Florida Museum of Natural History’s Division of Ichthyology (UF) has embraced not only a significant responsibility, but also a formidable task load. The steps being taken to curate and assimilate the UMML collection and once again render accessible this valuable body of research materials are extensive, time consuming, and all together rewarding. The first issue confronting the UF staff has been one of logistics. 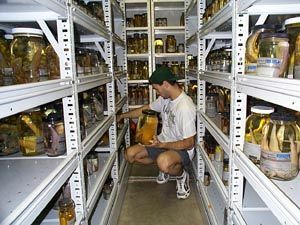 At this time the entire UMML collection cannot fit into existing Ichthyology space within the Florida Museum of Natural History, but more space will be made available in the near future. 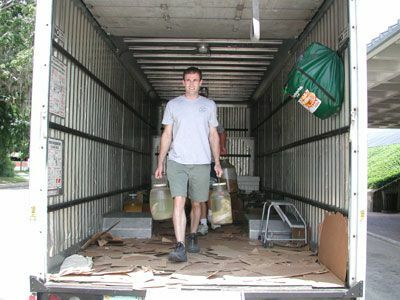 Considering the large size of the UMML collection and the somewhat sobering lack of available space currently allocated to Ichthyology, an affordable storage facility was secured to house the boxed collection upon its arrival in Gainesville. This warehouse, located in the town of Alachua, nearly 20 miles north of the Museum, provides a 4,086 square foot room for the temporary storage of the Miami collection. All catalogued specimens, boxed and arranged by family during packing in Miami, are labeled accordingly and tracked by a master inventory log. These large boxes are stacked two high and consume the majority of the warehouse space. Large storage jars (2-, 3-, and 5-gallons) and specimen tanks are stored here as well. Given this foundation for the task of integrating the UMML collection with that of the existing UF collection, the process of bringing the collection to the museum has been approached under a system of calculated priority. As a prelude to any specimens actually being introduced to the UF collection, the contents of all UMML catalog books had to be entered into the UF customized electronic database, an aspect of the project that was begun and largely completed in 1995. In order to avoid any numerical conflict, while maintaining the integrity of the former UMML catalog numbers, the sum of 200,000 was added to every cataloged UMML lot. Thus, UMML 1 became UF 200,001 and any conflict with UF 1 was avoided. A simple subtraction of 200,000 will identify any UMML material cited in publication prior to the move to UF. With the database reflecting the addition of the UMML records, curation of the actual specimen lots was begun. From the outset, gaining a complete accounting of the important UMML type specimens has been a foremost concern. 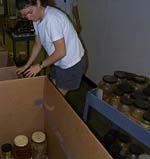 Consequently, every effort was made in pre-shipment visits to UMML and during the packing of the collection in Miami in December 1995 to isolate all type specimens. At UF, once these types were inventoried and curated, the focus was shifted to those specimens housed in small glass screw-top vials. Segregated from the jarred materials during packing, these vials represented the material most susceptible to desiccation due to their ill-designed seals. To date, approximately 9,825 specimen lots formerly housed in glass screw top vials have been inventoried, curated, and assimilated into the UF collection. Curation included removing specimens from existing vials and placing then in new plastic vials with slip-on caps, changing the alcohol, adding new UF labels, and placing the vials in aggregate vial-lot jars. Our current task, stage three of the project, involves curating small jar lots in a group by group fashion. The final phase of the process will involve curation of the largest specimens, which are housed in tanks and large jars. Although few in number compared to the collection as a whole, this material represents a substantial challenge in terms of bulk and requisite resources. 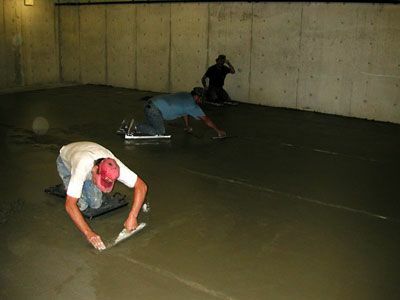 The details involved in effecting the physical improvements listed above are considerable. The catalogued UMML material numbers in excess of 33,500 specimen lots. Currently, the Ichthyology Division employs 5 full time workers and 17 part time undergraduate volunteers and staff. Nearly the entire staff is dedicated to the UMML project in some capacity. Such cosmopolitan involvement can be directly attributed to the fact that this project offers students and staff alike an unparalleled exposure to countless examples of the vast diversity of fishes. The very nature of the UMML collection has encouraged a great deal of interest and motivation to all of those involved. Boxed specimen lots are retrieved from the Alachua storage facility and brought to the Museum by pickup truck. Upon arrival, the boxes are unloaded and carted to the courtyard outside the Ichthyology division. Museum collections policy dictates that all packing materials, including the boxes, be fumigated before they can be brought into the museum in order to prevent the introduction of pest organisms. Consequently, all specimen lots are removed from the boxes in the courtyard and carted to a staging area just outside the fish range for work-up. 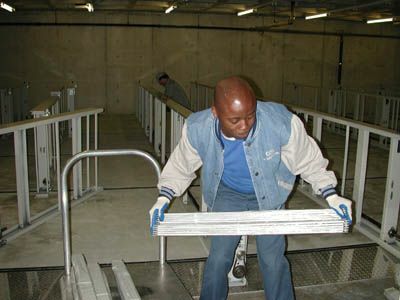 Boxes, paper, and the like are taken to a fumigation chamber so that they may be utilized at other stages in the project. 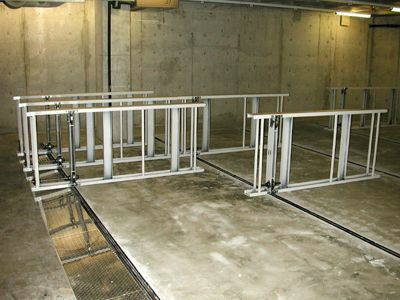 Once situated in the staging area, individual trays of specimen lots are brought to database computer workstations for inventory. At this time, specimen lots are noted as found and any relevant comments regarding their condition, history, and present disposition are recorded. If needed, collection data is augmented. Once a tray of jars has been serviced in this fashion, new UF labels bearing the modified catalogued number are produced. Subsequently, direct work on the specimen lots begins. When a student or staff member retrieves a tray of inventoried materials, a number of curatorial actions are made to those specimen lots. All isopropanol is replaced with fresh 50% isopropanol, as it is often the case that the alcohol has become compromised in quality or strength over time. Each specimen lot receives the aforementioned new UF label. All former labels and collector or determiner inserts are retained and placed directly behind the new UF label. All bakelite (hard black plastic) caps are replaced with new polypropylene caps with polyethylene liners that provide much greater resistance to evaporation than the archaic bakelite closures. Crayon markers are used for inscribing the new UF catalogue number on each new cap. This final touch facilitates locating individual jars when viewing numerous jars on shelves within the collection. Identified but uncatalogued lots that appear in the boxes of catalogued materials are dealt with in much the same fashion as outlined above, save for the insertion of a UF catalogue label. Time constraints prohibit cataloguing these lots at this time. 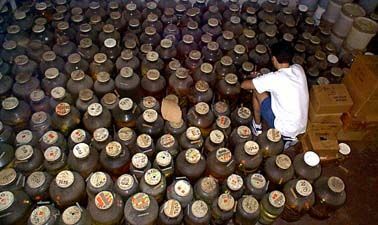 Discarded caps, the occasional unusable glassware, and the many gallons of replaced alcohol are all dealt with appropriately. 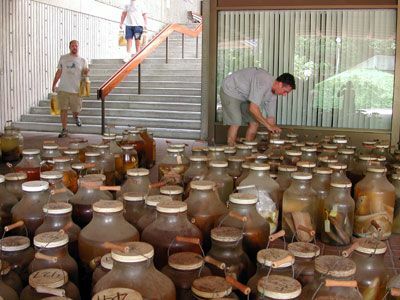 Such materials are recycled, discarded, or in the case for much of the alcohol, removed by UF’s environmental health and safety department for incineration. Once curated in this fashion, the specimen lots are ready for integration with the existing UF collection. Creating space for these curated UMML materials is a full time job. In order to achieve this end, potential tradeoffs have had to be identified, considered carefully, and eventually put into practice. 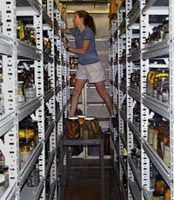 In this vein, all large UF specimens maintained in large jars stored on the bottom shelves of the compacted collection have been displaced to climate-controlled former exhibit areas of the Museum. This exchange, although far from ideal, has made available approximately 2700 square feet of shelf space throughout the collection for shelving catalogued UMML small jars and vial lots. 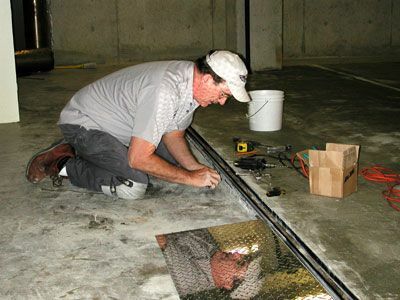 Other temporary displacements similar to the one described above have also been carried out in order to meet the overall goal of a united, well-maintained, and functional collection, including transfer of all UF backlog lots to the off-site storage facility. With a design for creating needed space in hand, it would seem logical to assume that the process of integration could begin in earnest. But before the large-scale physical integration of the collections could begin, a modification to the arrangement of the collection as a whole was agreed upon. Traditionally, the UF collection was ordered according to Jordan’s 1923 Classification of Fishes. 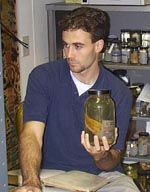 Since virtually every jar in the existing UF collection was expected to be moved as part of the UMML integration process, all principals involved in the project agreed that the timing was right for revising the existing numerical arrangement of the collection to reflect a more modern and consistent phylogeny. Consequently, all UMML material is being integrated in a phylogenetic sequence reflective of Eschmeyer’s 1990 classification of fishes, joining relocated UF lots in this new numerical system. Physically moving every jar in the collection also has allowed us to discover and deal with any UF lots needing curatorial attention. The combined catalogued collection numbers approximately 143,000 specimen lots and only tank specimens have escaped the scope of this process to date. In addition, about 70,000 identified but uncatalogued UF and UMML lots are or will be shelved alongside catalogued material, resulting in about 213,000 lots available for study. From conception to completion, the process of transferring, curating, and integrating the UMML collection of fishes is expected to encompass a period of nearly 5 years. As consuming as this work has been, there are still other facets of the UMML collection not mentioned above that remain unfinished. Future UMML-related projects of this ilk include not only topics pertaining to the UMML catalogued material, such as reconciling open UMML loans and documenting UMML-cited materials, but also the cataloguing of the uncatalogued portions of the UMML collection. This segment of the collection is estimated to be larger in number than the catalogued collection and includes such valuable material as the Tongue of the Ocean survey collections. We have designated the curation of the uncatalogued portion of the UMML as our next area of focus. As challenging as this project may seem given the details outlined above, the outlook of those involved has remained thoroughly positive and enthusiastic throughout the process. The work embodied by this project affords divisional staff a tremendous educational opportunity and valuable museum experience. As decidedly important as this project has been for the Museum and for the ichthyological community, the value of the experience for the individuals involved cannot be overestimated. 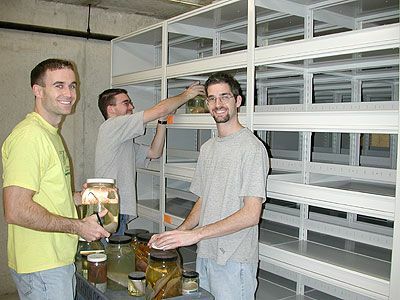 As a result of the University of Florida’s assimilation of the University of Miami Marine Laboratory Collection of Fishes (UMML) during the period 1995-2000, already limited space was quickly overwhelmed to the point of many thousands of specimens being displaced to temporary storage areas. The unfortunate outcome of these events has been greatly reduced access to these displaced specimens, which include both UF cataloged and uncataloged lots in addition to still other recently adopted orphaned collections. 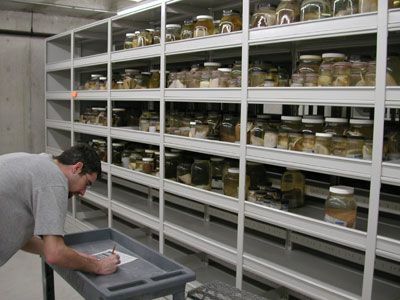 In concert with long anticipated changes in space distribution within Dickinson Hall, NSF funding of the proposal “Improvements to the Florida Museum of Natural History Ichthyological Collection” has provided a near doubling of range and laboratory space. 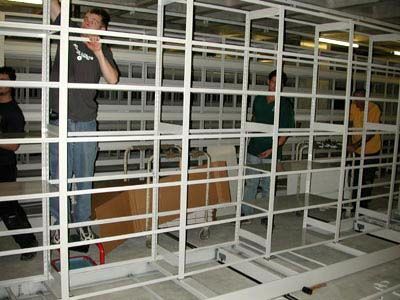 The November 2002 – January 2003 installation of a high-density storage system in the 2808 sq. ft. area directly adjacent to the existing compactor system translates to 5733 sq. ft. of range space and approximately 23,200 sq. 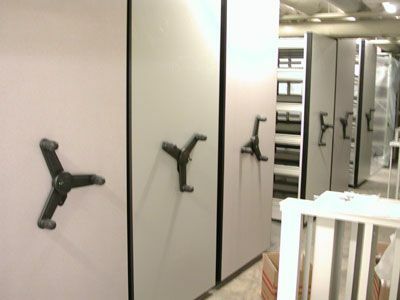 ft. of specimen shelving. Additional improvements include the creation of a small room for the growing collection of UF type specimens and a limited amount of space dedicated to housing larger fishes. 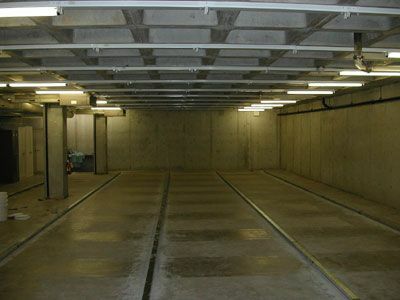 Redistribution of all materials into the unified high-density storage systems, both existing and new, was completed in June 2003.